I think like everything in the world being pregnant has its pros and cons. I know most pregnancy is a conscious decision but at the same time just because you decided to have a baby, does not make it compulsory to love everything about the journey. I have had my fair shares of ups and downs during the journey and today I am sharing what I enjoy about it. Here is the list of good things I am feeling since I discovered I am pregnant. I really think having is a baby is a real miracle. It is amazing to realise that we are cable of making another human being. A tiny bub is growing inside me, which is all my and my husband’s alone. I cannot wait to see and hold the baby in my arms. I know that it will be one of the happiest days of my life. OMG this is why I know some women say that they love to get pregnant again and again. Everyone spoils you. It started with my hubby becoming more caring and loving. I keep telling you guys that I have a great husband who has looked after me really well . But after we found out that I was pregnant, the great husband has become even greater. He constantly checks on me and asks “Are you OK?”, “Do you need something?” “Please rest and I will finish the job.” They are definitely music to my ears :). I feel so spoiled. In addition, other people around me are checking on me regularly and asking me about my well-being. No matter who I visit, they make sure I am comfortable and I am offered my favourite foods. On top of that you get the special treatment from strangers as well. I remember giving my seats on public transport to pregnant women and I am getting that treatment these days. No matter how busy or packed the buses or trains are, I am being offered a seat. How sweet is that? Because my placenta was on the front of my tummy, I didn’t feel much baby movement till I was over 5 months and I just loved the feeling of those limbs touching across my belly. For the last few weeks, I am feeling the movement even more, as if the baby is wrestling with itself and it makes me smile. Even though I may not be able to sleep due to that, I still love it as it reminds me that I am not alone. If you have been following my blog for a while, you know that I like to eat healthy and be fit but pregnancy has given me a reason to enjoy some guilty food without feeling too guilty. I know most people think that when you are pregnant, you can eat double but I don’t agree with that. According to what I have read, you can eat 10% more in the first two trimester and another 10% more on the last one and that is what I am following. I think physically I am doing well as I have gained only the recommended amount on weight and most of it is concentrated around my belly and I am still enjoying chips, Nutella and chocolates. I am very happy with how I look pregnant. I have days when I stand in front of the mirror and don’t like what I see. But most people tell me that I am doing well body wise and I want to believe it. As you know already I am a petite women and push up bra was my best friend. But since I found out I am pregnant, I have grown 2 cup sizes already. It feel good but the bad thing is, it is still growing and I have a feeling I won’t like it in a few months’ time when it is huge and uncomfortable. Because I didn’t have morning sickness, the first and second trimesters of my pregnancy were really smooth. I felt good and there were no problems at all. I was able to do everything as I normally did like eating almost everything, keeping up with my exercise routine and doing all the outings and planned holidays. That really made the journey more amazing as I didn’t have to comprise a lot just because I was pregnant. Apart from that, I love my growing belly and fell great dressing up. So far I haven’t bought any maternity clothes as I aim to fit into the dresses I already own. Moreover, it is working. Of course, I can’t fit into my super tight dresses but any dresses with elastic or flare, I am wearing them and it has been helping to make me feel better and normal. Also getting the compliments like, “You are looking great for a pregnant woman” from friends and family to doctors, midwives and complete strangers have helped boost my moral. I hope this feeling will last until I give birth. I think looking forward to the day when our baby will be born is the one of the most important wait my husband and I have done so far. Of course there were many important events in our life but they are like nothing compared to what we are looking forward to now. I love being in the moment, and reminding myself just how quick and important this moment is. I will never get these moments back, and they are amazing. One day I will be able to tell our baby how much joy I had when I was pregnant with him/ her. Please share your own experience and that you loved about being Pregnant. Of course, my pregnancy hasn’t been all roses and sunshine so I will be doing my next post about the Things I HATE about being Pregnant. Till then, take care. 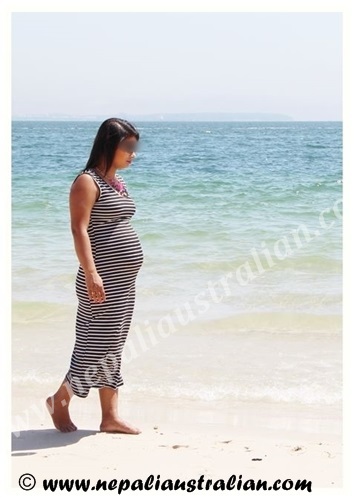 This entry was posted in My pregnancy and tagged 10 Things I LOVE about being Pregnant, australian nepali, i am pregrant, kathmandu, love, M from nepaliaustralian, Nepal, Nepalese wedding, Nepali, nepali australian, Nepaliaustralian, newari, our love story, pregnancy, pregnancy journey, Things I HATE about being Pregnant, Things I LOVE about being Pregnant, we are having a baby. Bookmark the permalink. I am really enjoying my good hair as normally my hair is thin and not too good. Enjoy this time…it’s truly awesome! I can’t say how I felt during pregnancy however I saw how my wife changed about many things. For example she was all set to the traditional Chinese resting month for the mother after giving birth. However during pregnancy she got very careful with everything and started researching and found out that that traditional resting month can be harmful for both mother and the child. I think most Asian culture is so similar as I know in Nepal as well they expect new mum to stay home for at least first 3 months. I am sure I won’t be able to to do that. Is it also like the Chinese resting month that the mother is not allowed to wash at all , eat all kind of oily soups which are meant to help to produce more milk (and actually do the opposite) and really do nothing but stay all the time in bed? I know that many cultures have a certain resting period but so far chinese have brought it to the limit, at least what I could find about it and what friends told me from university. I know that in Germany and in Finland there was the resting week about 70 years ago but that also changed a lot with modern science/ medicine. Things are surely changing in Nepal as well.But they still do lots of traditional things along side with modern medical things . 2 cup sizes up!!!! Husband must be super happy.